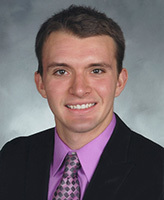 Adam Cowden, a 2012 graduate of Notre Dame’s College of Arts and Letters, has been selected as a Gates Cambridge Scholar. With the award, he will pursue a master’s degree at the University of Cambridge this fall. Cowden is one of only 40 students in the U.S. to receive the prestigious scholarship, from an initial field of approximately 800 applicants. Established in 2001 through a donation from the Bill and Melinda Gates Foundation, the Gates Cambridge program recognizes students for their social leadership, as well as their outstanding academic ability. “Adam is an exceptional student and represents the kind of dynamic undergraduate experience that we hope all students will have,” says Deb Rotman, the Paul and Maureen Stefanick Faculty Director of Notre Dame’s Center for Undergraduate Scholarly Engagement. Cowden, a member of Notre Dame’s Glynn Family Honors Program, majored in political science with a minor in Philosophy, Politics, and Economics (PPE). He says he has had a longstanding interest in addressing the issues of development and urban poverty. During his senior year, Cowden traveled to Botswana and Mauritius to conduct interviews for his senior thesis project on the impact of social welfare policy on family planning and educational participation. Following graduation, he has worked as a full-time, live-in volunteer at Su Casa, a Catholic worker house in Chicago, which primarily serves Spanish-speaking homeless families. Cowden credits Notre Dame’s Center for Social Concerns for connecting him to the organization on a service trip during his sophomore year. “Adam is a very interesting, accomplished, and committed student with a wide range of talents and interests,” says Paul Weithman, a professor in Notre Dame’s Department of Philosophy and director of the PPE program. “He is also committed to social service, as his long association with Su Casa testifies. That commitment to service has an academic dimension, as evidenced by his senior thesis work and his interest in international development. Cowden plans to pursue a master’s of philosophy in planning, growth, and regeneration at Cambridge. There he will study how economic disparities in cities can be reduced via spatial planning, land use, and public policy. Notre Dame’s Center for Undergraduate Scholarly Engagement (CUSE) provides students across the university with opportunities for research, scholarship, and creative projects. The center assists them in finding faculty mentors, funding, and venues for the publication or presentation of their work. It also promotes applications to national fellowship programs and prepares students in their application process. For more information, please visit fellows.nd.edu. Originally published by Carrie Gates at al.nd.edu on February 13, 2014.